Six days of challenge and adventure by a mixed team of four Senior Cadets and two Cadet Adult instructors. Arrived safe and well in Rjukan after a very long day travelling. My first step into ice climbing on steep ground today was awesome, it really took my climbing back to basics and made me focus on my footwork and personal movement skills during the climb. The climbing area today was in ‘Lower Gorge’ which is under the Vermork Bridge. The area is famous for ‘Heroes of Telemark’ and the daring commando raid on the hydroelectric plant in the Second World War. The temperature today was a cool -10c at the start of the day which made for a brisk start, but nicely warmed to -8c as the day went on!! The gorge itself never gets any sunlight between October and March, so whilst we could see the sun shining on the hills, we never actually benefitted from feeling the heat, apart from the heat we generated from the work needed to ensure our axes and crampons would bite into the ice!! After a short but demanding walk down the gorge we reached our first two climbs. The ice varied from bullet hard, into which a crampon point would barely penetrate, and soft snow ice which swallowed the whole axe pick. Our key lessons from the day included trying different clothing systems, our first taste of hot aches in our hands resulting from gripping our ice tools too tight and seeing how the crampons and picks best bite into the ice. We also learned not to look up when you hear the shout “ice” and how to eat frozen bananas during lunch. The evening was spent refreshing our rope work skills so that the climbing flowed more smoothly and we had a presentation on winter mountain hazards so that we were armed with the knowledge to be self-sufficient in the very cold environment. Day two in the big brother hostel! The initial plan was to head up the valley to Krokan which was quickly ditched when we discovered that it was Baltic with an air temp of -11c with a ferocious biting wind sending it even lower! A second plan was quickly hatched and we decided to jump back into the vehicles and descend down the valley to an area called Ozzimosis which was much more sheltered. The three main routes today were Skrueis WI3, Anakje WI3 and an unknown route at roughly WI2, where Mike did a perfect demonstration of how to re-fit a crampon whilst climbing!! The focus of the day was really about climbing on steeper ground and honing the skills learnt, particularly footwork and organising ropes etc. The view from the top of the climbs was awesome, being able to see back down the Rjukan valley. Highlights of the day included belaying from a cave. This was our big multi-pitch day on two big water falls, and it did prove to be a true. adventure. The more experienced team managed to get down by 4.30pm having climbed a popular and famous route called Bolgen (WI3), the cadet teams descended in the dark using torchlight. This was a test of endurance for the cadets as they had to focus fully on their rope work and be an active part of each rope team in order to descend to the valley in a reasonable time although it resulted in a long day out. 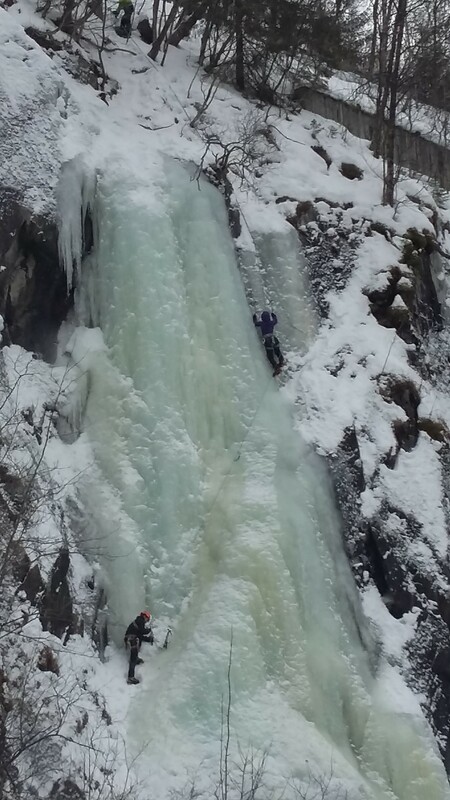 The two ice falls climbed today were contrasting in that Bolgen was narrow in places with areas of very steep arm pumping ice whilst the cadet teams climbed a shallower angle icefall which allowed them to focus on the six pitches of multi pitch climbing. The day was topped off by heading straight to the restaurant for some well-earned food. Everyone happily tucked into the meal and reminisced about the adventures. A great day climbing in the lower gorge, taking in a couple of much shorter routes after the previous days long tiring day. That said, the routes climbed were still physically testing with the cadets starting to be far more proactive in organising ropes and belay points without being prompted. One route was still climbed in three pitches which honed the additional skills learnt from the previous day. Russ managed to complete his first lead on ice, taking in the final pitch on Knerton. The feeling of being let off the security of the top rope being in place really did test me and made me think about the basics of climbing on ice. The cadets enjoyed filming each other and generally having a much more relaxed day. Today saw the team descend into the upper gorge which has a real atmosphere to it as you are in a wide rocky fissure cutting through the valley with steep rock and ice on either side. It is also the scene of numerous world class ice routes which has visitors from around the world coming to do. 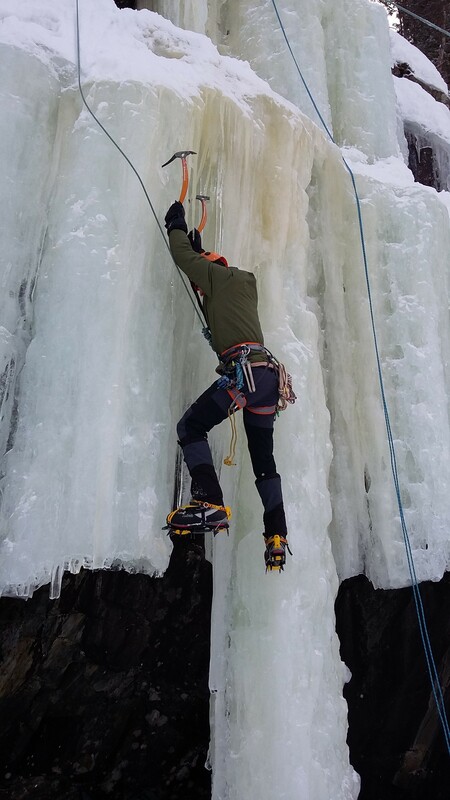 The routes were all in top condition and allowed the team to jump onto some quality ice from the word go. Being in the gorge allowed the team to watch other climbers on more serious routes including one called Saboteurfossen. 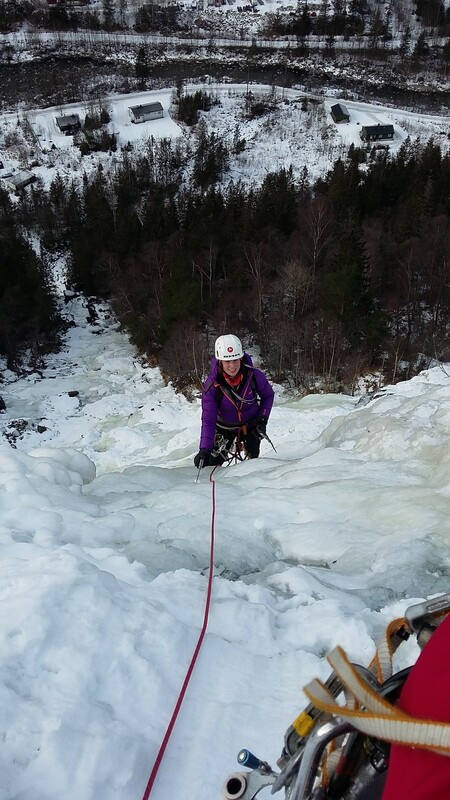 All teams started on a pleasant winter ice 3 route called Nedre Svingfoss. The teams then went various ways with WI 4 routes being climbed well by teams today including Vermork Brukfoss Ost and Host. The day was topped off by the cadets organising a lovely evening meal in the hostel – we even had candles! The story of the day was to allow everyone to push themselves that little bit further. 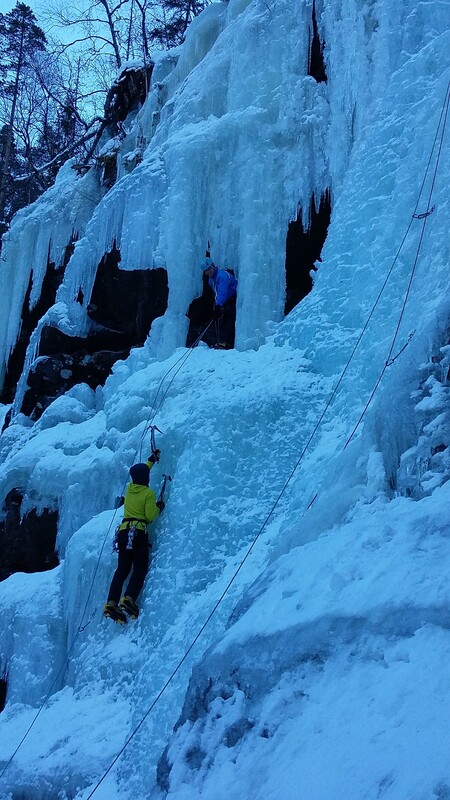 All teams showed some courage on some winter ice 3/4 routes which had some very steep sections. A notable route was an unknown route which included a fully formed ice pillar. This route made climbers consider their foot placements more and also using the hooks already in the pillar. Tisha did an interesting move leaving her ice axe hanging in the ice, whilst falling off! She then had to pull herself back up using just one hand and super girl powers! Two cadets successfully completed their first ever lead on winter ice, which was a fantastic testament to their own perseverance and skill. Angus said that the experience was totally different to being on a top rope and really channelled his skill set. This expedition was so much fun due to the people who were there experiencing this type of adventure. The memories will last for a long time and friendships will continue. “This was one of the most enjoyable learning experiences ever had” said Hannah. Comfort zones got pushed to new levels and cadets learnt more about themselves on this course than on many others.